Put some bite into your musical listening enjoyment! 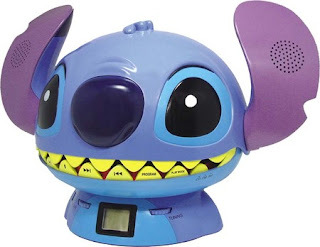 Here's the Stitch CD player - based on the Disney cartoon character from 'Lilo and Stitch'. 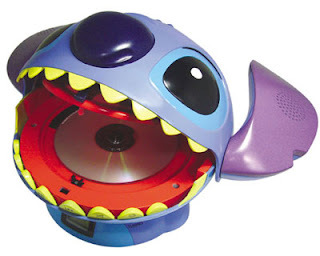 In the movie, alien experiment, Stitch, loved Elvis Presley so it's only fitting that this CD player/radio be fabricated in muso Stitch's honour. His teeth are the controls, his ears -- speakers. It's a bit strange but the silly factor wins out. For now, this guy is only available in Japan. Shame, really! He'd look awesome in my living room. That is actually pretty cool and something I would by... and then hide everytime someone came over.